2016 was another busy year demonstrating our various skills at different venues around Stratford. Details of 2017 demonstrations will be posted shortly. 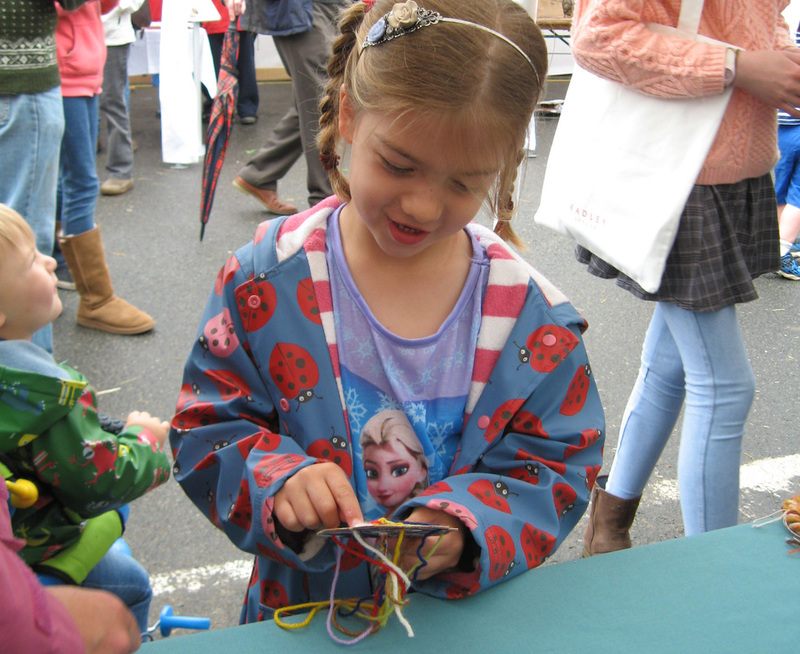 Our first demonstration of 2015 and our first visit to Bloxfest. After a showery morning the sun shone and two enthusiastic braiders sat on the grass under the apple blossom to concentrate on their new skill. A “sheep” and her brother a “mouse” were quickly at work on kumihimo cards. 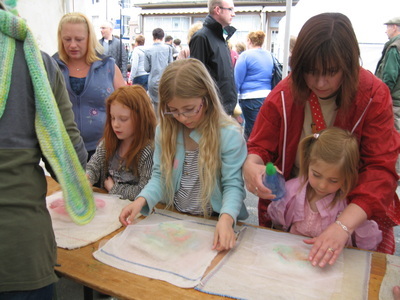 We demonstrated tie-dyeing in a cold indigo vat, with pieces of cotton for the public to try for themselves. As usual the “magic” change in colour as the cloth is exposed to the air fascinated the public, and the tied effects produced some lovely patterns. These are some of Abby's larger samples. The guild has been demonstrating at Mary Arden's Farm, Wilmcote for many years. At first we went to spin on their shearing day. 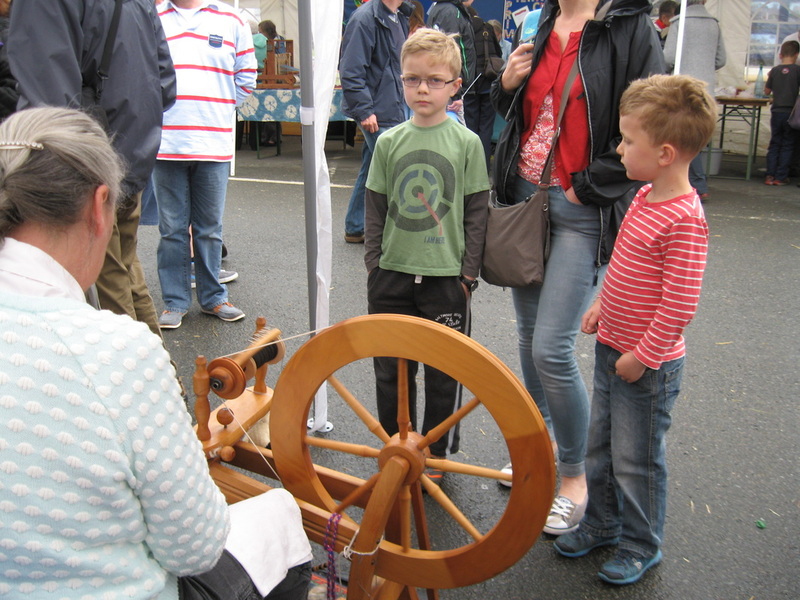 This gradually expanded and we now go to all their special weekends, not only spinning but giving visitors a chance to weave a small mat on a peg loom and to start a kumihimo braid on a small cardboard disc, which they can take away to finish. Many of the visitors are tourists but the local season ticket holders regularly enjoy the chance to make something. We first went to Shipston Wool Fair in 2011 when we demonstrated felting for the first time. This was very successful with queues of people wanting to try this technique. 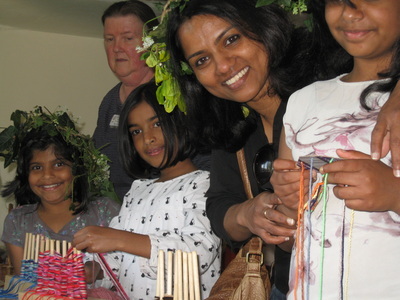 We showed a range of weaving techniques and, having washed and dried a freshly sheared fleece that morning, helped spin enough to knit a specially designed hat. 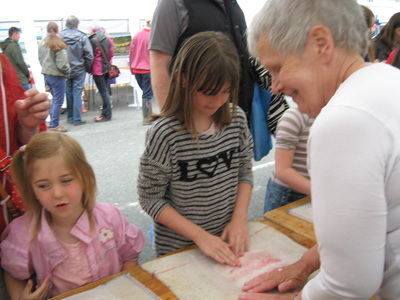 The following year, as well as repeating the felting, weaving and spinning demonstrations we featured a tapestry, designed by Ros Lobb, which we invited the public to help us to weave. 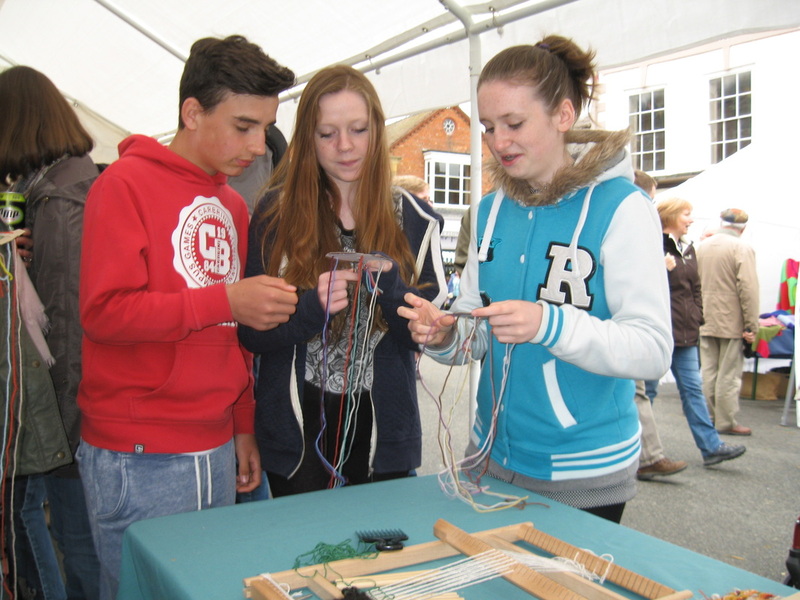 For the last two years the loom has been set up in the Council House, the High School, Shipston Needlecraft and private houses and many people have contributed varying amounts of weaving. At the Wool Fair this year the finished work was unveiled and it is now on show in the pop-up Heritage Centre in Shipston. 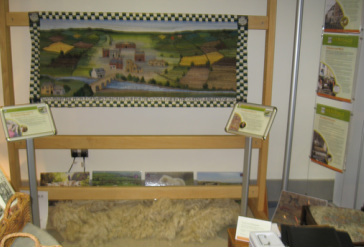 www.shipstonwoolfair.org and follow the link to the Heritage Centre. Click here for photos and reports of previous years' demonstrations.